Give the gift of friendship and tenderness with a Giant Teddy 6 foot stuffed bear like Shaggy Cuddles. An extremely soft and huggable bear with a heavenly plush amber coat. Its big brown eyes are filled with a lively twinkle, an expression of the love and kindness that extends to Shaggy's new home! Its chubby nose is made of smooth velveteen fabric; divinely soothing to the touch. 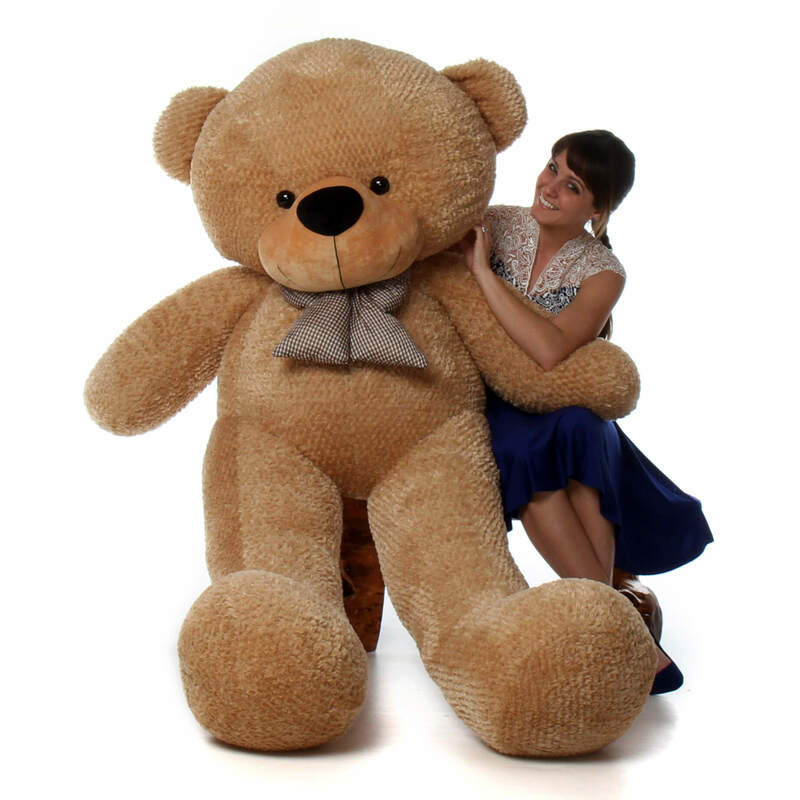 This precious, well-proportioned life size teddy bear is stuffed with love in the USA and measures 72" in height. Shaggy is also available in smaller sizes in a kaleidoscope of colors. He wears a dashing checkered bow that adds the right touch of whimsy to its design. Being well constructed, durable, made with child safe fabrics & components and meeting or exceeding all US safety standards, guarantees, that Shaggy Cuddles is perfect for snuggling! A wonderful collectible, as all Giant Teddy bears are! Best gift give to girlfriend! I am very pleased with the 72" Shaggy Cuddles Soft and Huggable Giant Amber Teddy Bear, and the service provided. My fiance loves it and thinks it was the perfect gift from her 'Huggybear'. My woman was completely overwhelmed & satisfied by the arrival of her 6 foot teddy bear & fell in love immediately. A must purchased if you're significant other loves cuddling. I was pleasantly surprised that Giant Teddy shipped the bear on the date that I requested and arrived on the day i requested. The bear itself arrived tightly in a box and sprung up when opened. The bear is not a clutter and is extremely comfortable. I highly recommend. Giant teddy was a birthday gift and it was a home run!!! Teddy came in a vacuum sealed bag, following instructions, I immediately opened it and teddy inflated almost instantly to its 6FOOT size! It's just as advertised! Super soft, cuddly, and well made!! I inspected every detail and it was perfect, I am impressed by its quality! Not only does my daughter love it, now everyone else wants one of their own!! This Bear Shipped so well. I was really nervous on how well the bear would hold up during shipping and unpacking. We opened it up today. Was a Christmas present for my niece. It was perfect and the fill in the bear was perfectly in tact .. not lumpy or misshaped anywhere. Niece loved her bear so much she cried. That is i a win for any aunt on Christmas. I got this bear for my girlfriend, and when it came, I was surprised. It comes in a small box, and inside is the bear vacuum packed. When you take it out, the bear is incredible. It's huge and extremely adorable, it is also one of the softest bears I've ever bought. It was worth every penny.